He has no chance.No wonder he was bribing her with food in the trailer. This drama is so nerve wrecking. I get anxious watching it. It's unpredictable too, which makes even more fun to watch. I want TY&ML to pull through together until the very end. QH still has ML in his heart grinds my teeth. Move on dude. He's like a fly ready to be shoo away w/a bug swatter. I can't watch the stepmom scene.. She is despicable and the most evil character in this drama...what's more she is actually best friend with Auntie Kang, the equally detestable evil maniac character. I feel like slapping soundly both of them when they were gossipping at the house party. Or just ask ml to slap them for me. Ml slap is the best. The sound was crisp. The angle for her hand just high enough to give an optimum effect abd the location of slapping was exact.. Ha ha. Wow.. Ml & gty wax wedding figure Madame Tussaud’s Wax Museum, just arrived today. They're both so heinous. They try to kiss up to QH& his wife and TY & ML 'cus their dumbnut of a family is now in a rut. Such two-face rats. Just throw the whole Gu house away in the pigsty. The so called fight was good for them.. I can see changes in ml where she was more open.. Lol. She hit gty few times. I dunno why ppl say ML is not jealous of GTY with another woman becos she does, only she didnt show it to GTY. First when the servants were sent by the Gu clan, there's a pretty Mingyue. She gave specific instruction not to let anyone including MY to go close to GTY's study nor his approximity, even if her excuse is she didnt trust all of them. And she told the girl her husband doesnt like her, which is true but GTY never tells her directly abt the girl. We know ML is someone who is very good at dodging & evading to avoid confrontation. However she is very clear & being trained from young that capable men in her era will have more than one woman in his life & that's why granny wants her to marry a man without title but still trained her to control household & concubines. ML even told GTY if he wants to take in concubine in future please find someone who can lives in harmony with her. Afterall she is a concubine's daughter & understand not all concubines are vicious. Also she understands concubines have their circumstances too just like her mother, & so does her husband, even if he refuse to have concubine but if gifted by the king he still has to accept. Thus all she wants is her husband to be fair. 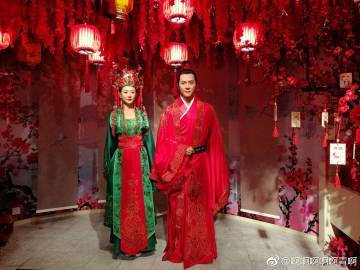 And since GTY doesnt have a concubine everyone keep sending & offering one to him & rather having someone send to GTY, it is better for her to find a girl of her liking, screen her to ensure she's free outside entaglement before sending her to her husband. Once he has a concubine it will quiet up people & wud leave them in peace. I think in her mind emotions such as love & body needs such as lust are 2 different things. However men with vast experience like GTY knew better. From the time he falls in love with ML long ago since she lecture him abt bringing up Rong'er the right way, he decided to clean up his messy life, & make himself worthy of ML in her & her family eyes, he has been true to her ever since. And having her body & soul is his greatest achievement & that he wudnt trade off with anything or anyone but ML doesnt know this. Of course young ML doesnt really understand it becos a concubine is just a higher level servant who serves her husband in bed. Even if she is jealous she wud be understanding & accomodotive becos she loves her husband, which likewise GTY doesnt understand. Honestly I think ML IS jealous, that's why she quickly went to sleep & sleep like log, so that she didnt have to think what's happening in the other room & that morning will come quickly so GTY will be by her side by then. Its only GTY was being childish & petty since he was head over heels with ML that he wanted ML to be possesive just like him. Only he forgot ML is a woman, thus her jealousy is shown in a different way than a man. Omg QH was being so petty but when GTY was rubbing salt on his wounds and telling him how it is whether he keeps being in denial or not, he had to remind him and it hurt me to see QH cry. Because I can feel how much regret and resentment he must have for losing the love of his life. If I think about it, it’s like the saying, we were destined to meet but not to be together. I am a little at agitated with GTY, because I feel he should be a little sympathetic towards QH. But like I said he is an opportunist and a go getter. I understand QH can not trust GTY again. Although he prayed ML to have a good husband, the last person he wanted to take her away was someone who was close/related to him.... But in due time hope he gets a wake up call and let go his pain and just learn to accept that ML was the love that got away. Now that GTY has taken ML from QH and Dr He, all the more he should cherish and treasure ML. I feel so sad for GTY kids. So sad to be birth with evil mother. That sixth Liang has no idea. He really pushed the buttons. Lol SH has been kept in the dark far too long, good for him to realize that CL is not just a liar who played him but also a murderer and his daughter Molan as well. The dowager can kiss my left toe. TY wants to appease endless corruption but she wants to stir up problems for him. TY literally saved the emperor. If it wasn't for him, she would've been sliced porkchop. Ungrateful . I just downloaded google chrome for now as suggested on viki discussion. And watching from there. Honestly I think ML IS jealous, that's why she quickly went to sleep & sleep like log, so that she didnt have to think what's happening in the other room & that morning will come quickly so GTY will be by her side by then. Its only GTY was being childish & petty since he was head over heels with ML that he wanted ML to be possesive just like him. Only he forgot ML is a woman, thus her jealousy is shown in a different way that a man. I think We all know she is jealous and she is just not showing it to maintain peace, but we are the viewers so we know but the characters do not know, unless they are meant to. So I think what we all are trying to say is that, she is in love and she is also jealous, but she should also show it, if not to everyone, to the person she loves at least,..
For one I'm not really feeling pity for QH anymore, he made faults, GTY made faults, Dr He made faults, but those 2 didn't deluded themselves that it was because of people that they lost what they lose, so he really needs to wake up because it's getting so much like a baby losing its candy cry.. And I think GTY really cherishes ML and his cherish is one of the reasons ML feels anxious too, saying it's too good for her.... They both just need to not put some clause of the past over their relationship.. I do wonder if the woman ML took in has malicious intent tho. What I thought was funny was the woman looked pretty please and smug with herself when GTY said he's spending time with her...only to actually have him sitting there ignoring her completely! And everytime she tried to approach him he just stood up, opens the door and talks to Shitou. That smug look on her face showed that she was probably expecting a position but we saw that GTY wasn’t really going to sleep with her. I think she stirs up trouble if that’s her that was trying to take a blade to the throat in front of ML in one of the previews? Probably because she has not been made an official concubine and GTY basically didn’t want her or touch her. Also so on another note, in one of the previews we can see that 3rd Gu bro, GTW, may be aligning himself with ED like in the novel so we may see that twist in his character since he can’t get away from Stepmom’s influence completely. @cherubstomato Yes QH is very petty, First off he should have correct his mom when she first went to the Sheng house offering gifts as brothers and sisters.. She had a whole different agenda when she lied to him in the first place but she lied to him.. Him offering ML the necklace sealed it for her that they could never be.Mom offereing the neckl;ace said it all that she didn't want any of the Sheng daughters tied to her household.. He should really be venting his anger towards his mom.. She's the one that F him over.. If he was so bent on having ML he should have made it clear right then in front of everyone about his feelings towards her and he wouldn't have her as his concubine as mom wanted but his main wife.. If he would have spoke up in the beginning he would have seen the fruits of his labor.. Not be mad at GTy for something he didn't and could not bring himself to do.. Even after marrying twice he still choose to not let his pettiness go and move on..
You may call GTy and opppourtunist but I see him as a go getter.. GTy has seen the ways of the world at a very young age and knows nothing comes to a sleeper but a dream.. If you want something you have to by all means go after it and thats what he did.. GTY seen the rare jewel that ML was something that QH never knew was there and still to this episode not know.. If ML had married him she would have for ever been living in her shell with a lot of bottle up emotions pint up inside her that would have been enough to kill her.. Not counting all that QH mom would have been doing to her just because of the fact she's a concubines daughter.. I don't buy SH crap about not knowing CL was involved in this.. He's a man of the court and not only that he knew she was the only one with motive to do something like this.. SH played dumb just for the simple fact he didn';t want to tarnish the SHeng family good name or lose his face..Ml told him as a child how they were starving and no heat in the home.. He really didn't do a thing about it.. SH never cared for ML or her mom.. What tees me off even more is that he didn't have to sleep with her if he wasn't going to be responsible for the children he fathered with her.. @ForgottenSoulx Who was the person we were conversing with on SH and how much of a dirt bag father he is towards ML.. I really wanted to reach out and touch him in the last episode for trying to slap ML in regards to the witch,.. My thoughts went back to Molan sleeping around in a temple but he didn;t slap her nor raised his hands to hit her.. I was hoping ML check Molan husband about her minduing her own business. But he'll learn soon enough what kibd of woman he married she's no different then her mom there's no love there..
Molan so jealous of Ming Lan all she wishing and praying for his for ML downfall.. She's praying for ML husband to fall out of grace with the court.. But she still has no idea no matter how hard she falls she still has a bed of money to fall on and bounce back up.. It's not like they ate depending in the courts to provide for them and ML has a business mind set I'm sure she could make them even more richer of she puts her mind to it.. I was thinking that too. But he seemed fine with GTY inheriting the title. Maybe he's being used by ED to frame GTY....he doesn't seem like a smart cookie.....thinking that GTY respects his mother and had a good relationship with her before. And gifted concubines always come with ulterior motives. They come to fulfill the intentions of the gift giver....good or bad.